two rails in a few seconds. to pull down the mandolin / soft rail. A clockwork motor is just below keyframe at the front and is wound at left side of case; speed control at left. The spring is dated April 1920. An oval mirror in top centre panel is surrounded by a small amount of blue and green coloured glass. There are cloth backed panels either side of the mirror. 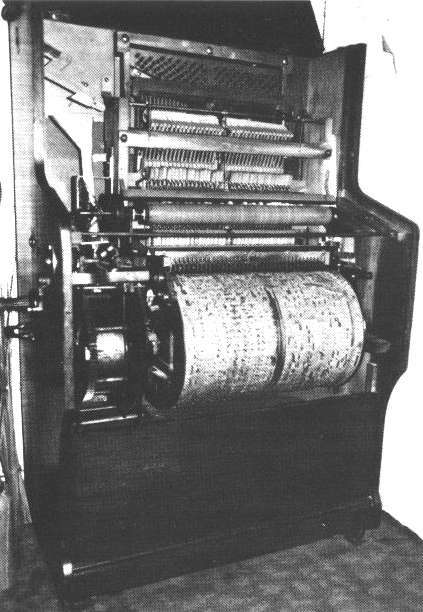 An unusual kicking-shoe action with a large metal roller rotating constantly; the key shoes are kicked by the roller to play the note. [ This sounds like the Pianotist mechanism. -- Robbie] The back of the piano has a wire gauze covering on a frame to allow air-flow, while keeping insects out. (I need a supplier for this fine gauze, 1 meter square in size). There are two five-tune barrels, which can be changed over in a few seconds. Simply lift a lever and the barrel slides out of the front of the case, there are even 2 finger holes to aid quick removal of the barrel. The coin box did have a lock, now missing, and is not accessible without removing the barrel. The coin box is huge and would hold several hundred coins. As the barrels were standard to fit many machines, does anyone know of spare barrels? A similar instrument as Kevin McElhone described in MMD 020318 is in existence in Deventer, Netherlands. The Pianovo had been playing in a pub in Wesepe, a small village in the East. It took in Dutch 5-cent pieces. Hendrik Strengers wrote an interesting article about the Pianovo in Het Pierement, issue 1986, p. 41-42. I have sent two of the pictures that went with the article, so MMD'ers may have a look at the innards of this interesting machine. All inscriptions inside are in German. The apparent number is 6050. Mr. Strengers thinks the Pianovo may have been made by Popper in Leipzig, but as there is no name inside the instrument; the proof is only circumstantial. No other specimen is known to us. (Anyway, there are now two Pianovos known to exist!) I hope this will help us all to establish the builder. 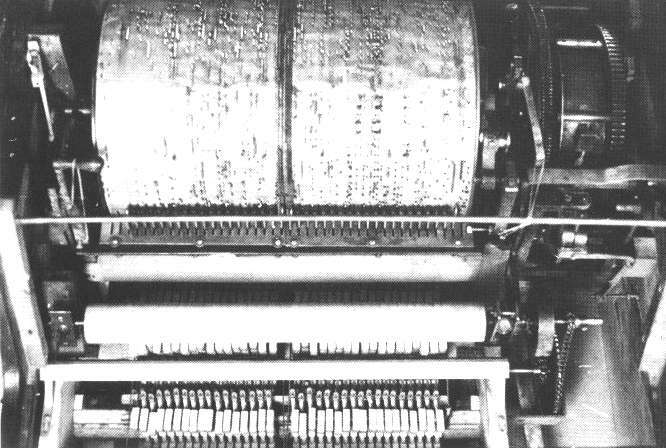 These two pictures of a Pianovo were published in Het Pierement, magazine of the KDV, edition 1986, pages 41-42, together with an article by Hendrik Strengers. Copyright: KDV, Netherlands. Permission to publish these pictures at the MMD web site was kindly granted by Kring van Draaiorgelvrienden (KDV).